🔹Martha was serving Jesus, but Mary was encountering Jesus. 🔹Martha was doing good things, but Mary was doing the PRIMARY thing. 🔹Martha was being hospitable to Jesus in her home, Mary was being hospitable to Jesus in her heart. 🔹Martha was concerned about what her guests might think of her less-than-perfect hospitality, Mary was concerned with what Jesus wanted to do in her own life. 🔹Martha recognized the special influence Jesus had in their social gathering, Mary recognized the special influence Jesus was having in her own heart and soul. 🔹Martha was good at seeing people’s needs and recruiting others to jump-in, Mary was good at seeing the PRIMARY need and personally drawing near to Jesus for fulfillment. Sometimes the best strategic move we can make in witnessing to someone about Christ is… not to mention Him. The other day I was at our local grocery store, standing in line at the cashier stand with about 15 items loaded onto the conveyor belt. It was a busy time of day, all of the cashiers had a line of customers waiting to be served. A gentleman stepped into line behind me, he looked like he had been working hard that day, his work clothes being adorned with fresh dirt, grease, and oil. In his hand was a single item for purchase. He said it not too loud, but it was enough for the people around our cashier to hear it. Another man chimed-in with an encouraging word to the gentleman, and there were lots of smiles as we all engaged him for a moment. The gentlemen’s facial expression and his tone confirmed to us that he really was having a bad day up to that moment. For just a second or two in time, I thought to myself how I might engage him conversationally with the hopes of sharing some even better news with him about Christ. Not preaching, not in-your-face, just a casual word or two, or just even a hint of the Lord. He thanked all of us again for our small gestures and words of kindness, he picked up his single item and walked toward the door. When someone turns their life over to Christ, it is almost always the result of a process over time, not just an instantaneous hear-believe-saved moment. There will be people in their life that God used to break up the hardened soil of their heart, and others who planted the seeds of life, and still others that came along and watered those seeds. It is God who oversees the whole process, from beginning to end. My role in the gentlemen’s life at the grocery store may have been to help break up the hardened soil of his heart with a simple gesture of kindness and thoughtfulness. No, it won’t be the critical moment of his salvation, but it may be one experience of many that eventually culminates in his entry into a new life in Christ. Maybe the next believer he encounters will have the role of planting some seeds, then later another person to water those seeds. We cannot limit ourselves to only doing the BIG things that will result in the BIGGEST outcomes (though those moments certainly are wonderful to see). We are co-workers with each other and with God, and God is the one who is overseeing the gentlemen’s progress through the process of attaining faith and a new life in Christ. Who knows, maybe the next person that I encounter will have already been served by a number of others, and I will have the privilege and joy of being there to lead him in his final step of faith, to accept Christ. Even more important than our willingness to go anywhere under any circumstances to preach the gospel, is our willingness and sensitivity to hear the Holy Spirit direct us to go here, don’t go there; say this, don’t say that; do it now, don’t do it yet; do it this way, don’t do it that way. After all, in ministry we are not doing things for God, we are doing things with God, and He is our Commander and King. The God of Abraham (Jehovah) is not the same as Allah, even if a Muslim declares it so. Jesus, whom you revere as a prophet (but not as the crucified and resurrected Son of God) spoke to some Jews who claimed that their God was also Jehovah. Jesus pointed clearly to the fact that just because one claims to follow the God of Abraham does not mean that it is in reality true of them. “Jesus replied, ‘If I glorify Myself, My glory means nothing. My Father, whom you claim as your God, is the one who glorifies Me. Though you do not know Him, I know Him. If I said I did not, I would be a liar like you, but I do know Him and obey His word. Following the God of Abraham means more than a religious adherence. It involves a love and an obedience (from the heart) to God’s words, spoken through His Son, Jesus Christ. This is absolutely true for everyone, regardless of their culture or religious heritage. Even Christians who believe that Jehovah is the God of Abraham, and believe that Jesus Christ is His crucified and resurrected Son, must also obey the word of God. Without obedience to the One True God, there is no hope, there is no forgiveness, there is no salvation, there will be no Heaven after this life. The Bible clearly states that even demons believe that Jehovah is the God of Abraham, and yet they shudder with fear at the enormity of His true identity, and they have no hope and no future. My Muslim Friends, I do not despise you for any reason, or because of your current religion and participation in Islam. You are my fellow human beings. You know pain like I do, you know sickness like I do, you know the weight of the guilt from sin like I used to. Yes, past tense regarding sin. Through Jesus Christ and His Father, the God of Abraham, I have experienced the power of God that brings life into the soul. There are many religions in this world, but only a sincere heart-acceptance of Abraham’s God and His Son, Jesus Christ, has the power to break the hold and the guilt of sin. I know you believe in the practice of prayer. As a Muslim, you have no doubt prayed many, many times. However, if Allah has not responded to your prayers and brought peace into your heart, perhaps it is because you have been addressing your prayers to the wrong god. 🔹”I pray to the God of Abraham, Isaac, and Jacob. I pray to the God that created the universe, and created me. 🔹Please, reveal Yourself to me in a way that I will know it is really You. I want to know the One True God of the universe. 🔹And if Jesus Christ is Your Son (and was crucified and died upon a cross, and resurrected from the dead for the forgiveness of my sins) please, I want to know the truth. Now, look forward to hearing from The One True God! What happens to the salvation of Christians who begin to succumb to mental disorders of dementia, like Alzheimer’s or Frontal Lobe Dementia, which destroys their capacity to reason and to exhibit self-control? It is heart breaking to watch someone descend into such a helpless state of being, when their life has exhibited a genuine love for God and love for others but they slowly lose their capacity to reason, unraveling their godly reputation by acting out in ways that they would be utterly ashamed of and embarrassed by if they were in their right mind. Perhaps they begin to treat their spouse (whom they have loved and adored their entire married life) with disdain, suspicion, and even physical abuse. Their life of sharing and loving sacrifice turns into self-absorbed obsession and emotional isolation. They think and feel like everyone is out to get them, to steal their stuff, and to trick them. Family members find they can no longer reason with them because their capacity to reason has become broken and their ability for introspection has been lost. If you have a family member who has been a follower of Christ, but has recently succumb to a form of dementia where they are “not themselves,” their eternal soul is safeguarded in Christ. They may have become lewd, crude, abusive, and many other things (as a result of their dementia) but Christ has them in His arms. Christ knows exactly when someone is not exhibiting their true heart, and when it is their broken and short-circuiting brain that is at fault. The grace of God is sufficient for them, and the grace of God will be sufficient for you and your family as you patiently care for them during their final season in life. Throughout many centuries of New Testament church history there has been one question that has sparked many fires of contentious debate: Can a Christian lose their salvation? The You-Can-Lose-Your-Salvation theorists suggest that there is an extreme point that a Christian can reach where they effectually walk away from the Lord in their heart, abandoning their position in salvation. This is not easily accomplished, but is a danger for those who continually sin and show disregard for the warnings and disciplines of God. The Once-Saved-Always-Saved theorists suggest that a person who calls them self a Christian yet continually sins and shows disregard for the warnings and disciplines of God never was truly saved in the first place. Both camps have individuals within them that have broad variations to these respective doctrines and theologies. Sadly, each camp tends to misrepresent and exaggerate the other camp’s theological basis in an attempt to make their own doctrine seem more reasonable. “Naturally, if everyone would just accept my doctrinal stance, then this age-old church squabble could come to a peaceful end and we could all love each other in a more Christ-like manner…” or so every theologian thinks about their own stance. While it can be good [at times] to debate the finer points of doctrine and theology, it is by far ALWAYS the best avenue to encourage one another in the loving pursuit of God. So in this context, instead of looking at where exactly the lines may or may not be (and what they may or may not look like) between the “un-redeemed,” the redeemed, and the “de-redeemed,” let’s briefly look at the other end of the spectrum and focus on where the human heart connects with God’s heart. Jesus went on to apply this broad principle to a specific subject of choosing between God and Money, but the principle applies to anything that we seek that takes us in the opposite direction of God. Our attempts at playing with sin while remaining under grace is a very dangerous game, a game that reveals what our heart truly loves… and it’s not God. Jesus insisted that the object of our desire is singular, and singular only. There is no 50-50% or 80-20%. Some might ask, “But aren’t we all tempted?” Yes, most certainly each of us are tempted, but temptation is not the sin. The sin is that which we do within our heart and mind (and maybe even then physically participate) to fulfill the temptation. Do we return to that invisible line between the redeemed and un-redeemed so that we can “feel” some of the worldly pleasure without diving headlong into the sin? “Once your obedience is complete” is a reference to their in-progress maturation and growth from living in the weakness of their humanity into living by the power of their Holy Spirit-infused life. Our salvation through Christ is both instantaneous and progressive. It is instantaneous in that we are immediately positioned with Christ, we are His. He claims us as His own, and we claim Him as our One Master or Lord. It is progressive in that we undergo a process of transformation, a journey with Christ through life where we are undergoing a conformation to His character. 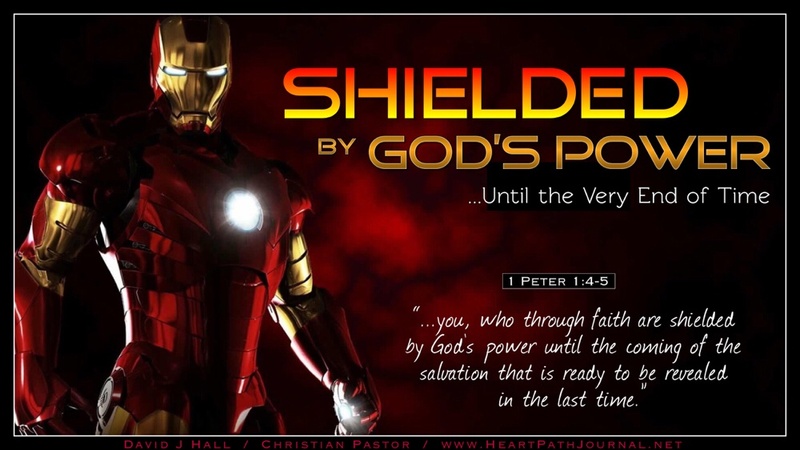 Our soul is shielded by God’s power until the final day when our salvation is revealed. No fear! Keep the faith! Are you having some not so-subtle enemy problems? Jesus teaches us how to respond to our enemies: we are to love them from the heart, and to pray for them to be blessed by God. Don’t worry, by loving them and sincerely praying for God to bless them, we are not condoning their attacks on us. We are simply seeing the big picture of their soul, their need of the forgiveness and salvation of Christ just as much as we do. Besides, you may be the only person in their world that is highly motivated to love them and to pray for them to be blessed by God in this life, and the life to come! Throughout history some of the baddest of the bad have changed their course in life by turning to God. “Here is a trustworthy saying that deserves full acceptance: Christ Jesus came into the world to save sinners—of whom I am the worst. 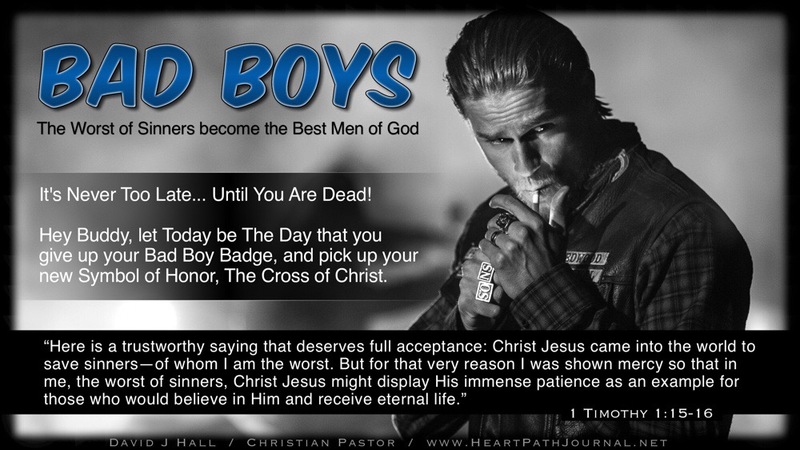 Hey Buddy, let today be The Day that you give up your Bad Boy badge, and pick up your new symbol of honor, the Cross of Christ. Let today be your day. Transforming Local Churches into Harvesting Combines. Every local church should be a contributing member of the global church, fulfilling the call of Christ [not only in being a place of discipleship, relationship, and training in the Word and Spirit, but] especially in the arena of becoming and functioning as a harvesting combine of souls. “The soul-winner must be a master of the art of prayer. You cannot bring souls to God if you go not to God yourself. You must get your battle-ax, and your weapons of war, from the armoury of sacred communication with Christ. If you are much alone with Jesus, you will catch His Spirit; you will be fired with the flame that burned in His breast, and consumed His life. You will weep with the tears that fell upon Jerusalem when He saw it perishing; and if you cannot speak so eloquently as He did, yet shall there be about what you say somewhat of the same power which in Him thrilled the hearts and awoke the consciences of men. Perhaps, if you are like me, it would be helpful to re-read the above quote several times so that the full impact of the message can be received, followed by an introspective application to our heart. If we are not earnestly praying for the salvation of the lost, we have not yet begun to be that which Christ has called us to be. The scriptures say regarding Jesus that He “came to seek and to save that which was lost” (Luke 19:10) and also in regard to those who are bound in sin, that He “was manifested, that He may destroy the works of the devil.” (1 John 3:8). The difference between the fruitful and the unfruitful local church [in regard to the harvesting of souls] is profoundly simple: the fruitful church contains some branches that have engaged in the simple yet profound art of soul-winning intercessory prayer. The unfruitful local church just won’t do it. Let us (you and I) agree to make a world of difference within the local churches that we are branches within (Jesus said that He is the Vine, and we are the branches). Let us (again, you and I) determine to see the prayers of Pastor Spurgeon for his local church in the 1800’s answered and fulfilled in our local churches in 2013 & Beyond. 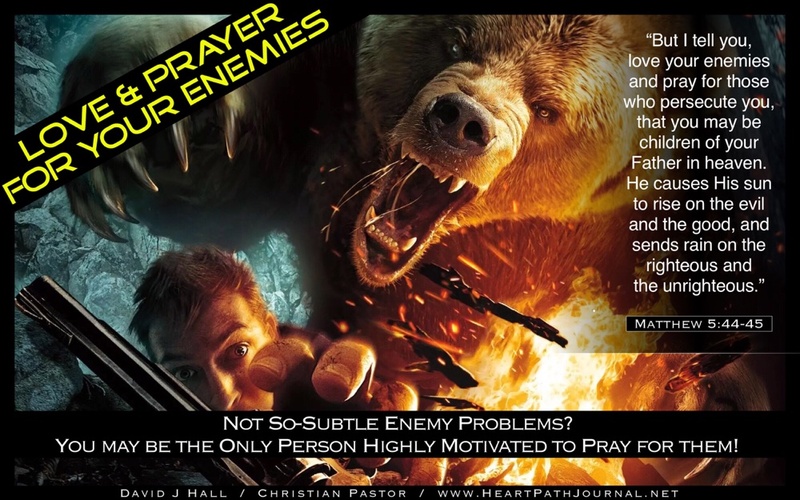 Let us (yes, you and I) master the art of soul-winning prayer!